Yup! I’m still alive. I’ve been inactive for like ages due to work but as we all know, you can’t just leave something you are passionate about, right? Well, hey it’s Monday again. I know most of you hate this day because for most of you, it means early morning routine (again…), traffic jam, and work. So, to save us from this desperation we need something wonderful to look forward too and for people who usually keep their nose in front of a book, what are you reading today or plan to read this week? Looking back, I was planning to read and review Uprooted by Naomi Novik and A Court of Thorns and Roses by Sarah J. Maas but I ended up reading it only. Maybe, I can leave a review for both this month if my schedule permits me to do so. I was really captivated by Uprooted. I loved it so much that I gave it 5 stars! The plot and world building are an absolute A+. I’m an avid fan of magical stories and Uprooted did bring out a very colorful world to my imagination. I bought this book because I fell in love with the cover and luckily the story did not disappoint! 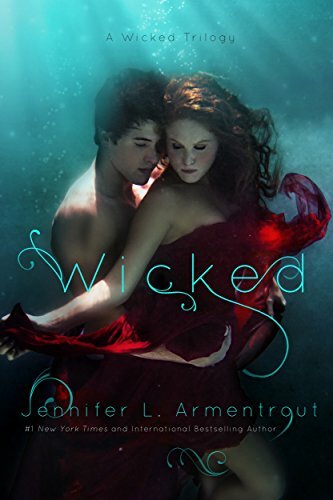 But for this week’s “It’s Monday: What are you reading.” I kinda miss reading paranormal romance so, I’m picking Wicked ( A Wicked Saga #1) by Jennifer Armentrout ( one of my favorite author). It’s been awhile since I’ve last read Jennifer Armentrout books, the last one was last year’s The Problem with Forever which is a contemporary romance that tells about facing your fears and the power of first love. That’s my It’s Monday! What are you reading? for this week. Don’t forget to check the latest Free YA Kindle Books and the Bargain YA Kindle Books available today on Amazon. Tell me, guys. What are you reading? Let’s talk! Comment below. I promised to be more active starting on August and today I’m starting this week with a meme. This is my first time to join a book meme and I really hope I’m doing it the right way. Last month, I borrowed the whole collection of Rick Riordan’s books from my best friend who was happy to lend it to me just to share the fandom and for someone to squeeeee with as the series continues to pile up. Anyway, you might ask why I haven’t read both series before. This is because I’ve watched the movie adaptation first and I didn’t like it that much. I know I shouldn’t judge, but first impression last. Hopefully, now that I have the books, I’m very much willing to be rescued from despair, I’m willing to give them all a chance. After all, I’m a mythology freak. I’m finishing off the book called Unlocked by Margo Kelly, which is scheduled for my review this coming Tuesday ( OMG! That’s tomorrow.) *sigh* I’ve got too much work piling up and I’ve been neglecting everything on my calendar. I’ve been wanting to start reading The Raven Cycle series, but it isn’t available in any nearby bookstores. Maybe, I’ll order it online via The Book Depository. But I’m still waiting for the Uprooted book I ordered last July 11. It is my first transaction with them, and I’m really excited to have the book. It’s one of the #buymecover books. I’ll be posting my Book Depository experience here soon, so better watch out. For this week’s read and “It’s Monday! What are you reading?”. I’m starting off with Percy Jackon and The Lightning Thief. I’ve read twenty percent of the book and thank goodness I’m already loving it. No wonder why you guys are all addicted to Rick Riordan’s novel. Percy Jackson is a good kid, but he can’t seem to focus on his schoolwork or control his temper. And lately, being away at boarding school is only getting worse—Percy could have sworn his pre-algebra teacher turned into a monster and tried to kill him. When Percy’s mom finds out, she knows it’s time that he knew the truth about where he came from, and that he go to the one place he’ll be safe. She sends Percy to Camp Half Blood, a summer camp for demigods (on Long Island), where he learns that the father he never knew is Poseidon, God of the Sea. Soon a mystery unfolds and together with his friends—one a satyr and the other the demigod daughter of Athena—Percy sets out on a quest across the United States to reach the gates of the Underworld (located in a recording studio in Hollywood) and prevent a catastrophic war between the gods. That’s my It’s Monday! What are you reading? for this week, I know I’ve got a long way to go with the Rick Riordan‘s book, but I really hope to finish it soon along with my other TBRs. Tell me guys. What are you reading? Let’s talk! Comment below.